List traditional roles and responsibilities. List primary tasks and activities. List acceptable and unacceptable staff behaviors. List specific desired results and outcomes—not merely activities. List the positive and negative consequences of certain related actions. The first step should also include a Personal Style assessment and job style compatibility process. 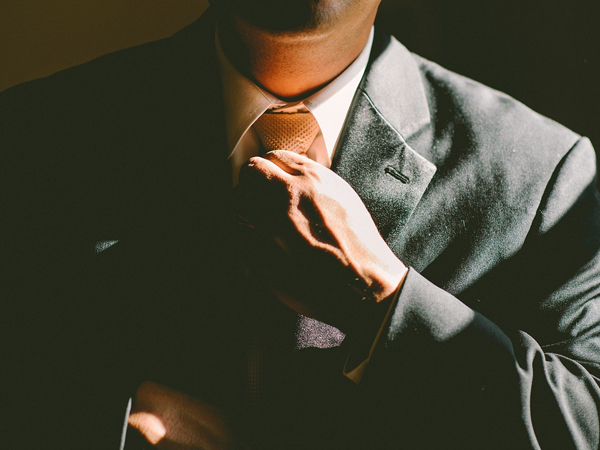 If the Personal Style of the candidate does not reflect the style requirements of the position, there is little one can do to increase or even maintain engagement. Proactively using this strategy reduces the chance of the “square-peg-in-a-round-hole” syndrome and ultimately, will save you time, money, and frustration. Here are some examples of lack of organizational support. One business required phones to be answered within three rings. With three staff members in the office and only two phones, it was quite a challenge. The business was not supporting the staff with the necessary resources to achieve the expectation that management had set. Another company wanted to expedite the cashier process, but to avoid extra monthly fees, was unwilling to add a second Point-of-Sale system. It was common sense that one payment system was not enough, and without it, the owner was not supporting his expectations with the required organizational support. These are just a few examples of how expectations are not met because the team is not given the resources to fulfill them. Let’s suppose you required brain surgery and CRG offered to perform your operation in an effort to follow our vision to attempt new things. Yet, no matter how enthusiastic we are, we simply do not have the training or the ability to perform brain surgery, or any other medical procedure, for that matter. A quick way to determine whether a person has the ability to fulfill a certain task/responsibility is to ask yourself one question: In the past, has this individual demonstrated the skill/ability necessary to fulfill this responsibility? If the answer is no, then you don’t have any evidence that this person has the skill/ability to successful fulfill the requirements. When a person is not motivated to perform a specific work task, find out why. Doing so is far more effective and beneficial for everyone than simply criticizing the individual. It is the manager’s responsibility to determine what is affecting the individual’s performance, because performance links directly to the company’s bottom line. The manager must become involved in order to help resolve the lack of productivity. In a study conducted by the Association for Talent Development (ATD) [formerly ASTD (American Society for Training & Development)], one of the number-one reasons for employees losing interest or engagement in a role was “responsibility without competence.”That means leaders give individuals new roles or responsibilities without the training and knowledge to fulfill them. This includes all soft skills like supervision, leadership, and management. Too many individuals are promoted or given new tasks without the training they need. Can you think of an individual who has successfully fulfilled a position, but this person’s performance over time seemed to drop?As a leader, you know this is not about ability, because that has already been proven. So your job is to uncover why the willingness has waned. Maybe the employee has some personal distractions, like health issues, relationships at home, etc.—which have nothing to do with the job. And remember, if the style nature of the position and the person are not compatible, the research confirms that their engagement over time is not sustainable, regardless of skill, willpower, or mindset. We know water and oil don’t mix, so why do we think this type of system will work for individuals?Quite simply, it won’t. There can be no fair accountability unless expectations have been documented—in writing—and agreed upon. Take special note of “agreed upon.” Just because you have stated a company policy or role expectation to someone does not mean that person has agreed to do it. Knowledge is not the same as agreement, and you can never have successful accountability without agreed-upon expectations. 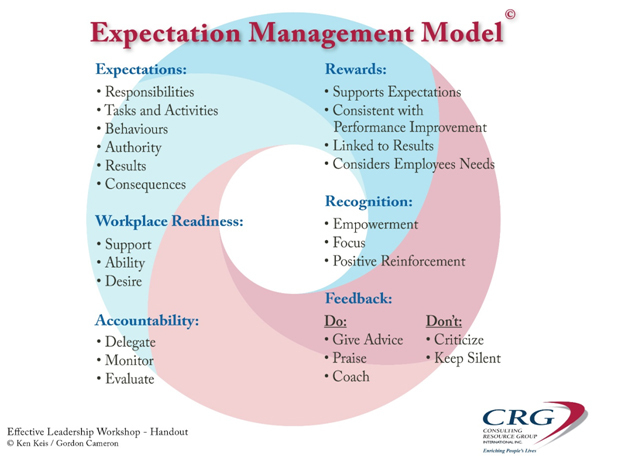 Further, team members can be blindsided by a manager upset by lack of performance, and staff may be unaware of the manager’s unwritten or unstated expectations. If you have been in the workforce for any length of time, you know this happens all too frequently. Consequences and accountability protocols must be determined and shared in advance; otherwise, inconsistencies will run rampant. One of the fastest ways to lower team performance is to let something go one day—with no consequences—and then lower the hammer the next day for the same behavior. Either you have an accountability process in your business or you don’t. Everyone must be held equally accountable. Being easy on one person and tough on another, for the same carelessness, is certain to erode morale. If you are willing to tolerate poor behavior from one person, you must also accept it from others. If you want to make an exception, you must build an “exception” into the written expectations so that everyone can act the same way. Two forms of feedback fail: criticism and silence. Having employees live in fear of verbal attack has never been a successful part of long-term, high-performance management, and silence can be even worse than abusive criticism. Over the long term, silence leads to the reduced performance of your team members. They do not have a reliable measurement for success and, as such, may start to second-guess themselves—or even become paranoid. As an example of the damage that criticism/silence can do, two long-term excellent employees from an organization were called into HR recently, and because of the culture, they both thought they were about to be fired. However, the purpose of the meeting was to ask them how to improve the process and support for their role. The culture of this organization was one of criticism or silence. In many cases, the first sign employees were not fulfilling unstated expectations was “You’re fired!”—no wonder they lived in fear. Affirm that the conduct of the individual was/is equal to, or greater than, your expectations. Make it behavior-specific. “Good job; well done,” is not feedback. Advice is clear, and linked to the written expectations. Model the behavior you want others to exhibit and lead the team through the process. Performance research indicates that the most effective way to improve, correct, or change behaviors is through immediate and respectful on-the-job feedback—as soon after the event as possible. This must be timely to be effective.Feedback two weeks after is too late; the example is long forgotten. Rewards should be saved for above-average performance. Typically, monetary or prize-based rewards must be linked to your written expectations and above-average performance. We have seen rewards systems produce behaviors totally opposite to the anticipated response. In one business, the sale manager wanted teamwork but incentivized only individual and self-centered behavior. Show me how you pay people and we will predict what they do and don’t do! Not everyone is motivated by cash. Because some team members will be motivated by other rewards, make various rewards part of the mix. Your organization should determine your rewards and recognition processes well in advance so that staff members know exactly where the goalposts are. One of our associates used our Values Preference Indicator with a client’s sales team—because ALL monetary rewards by management had failed—and then designed an incentive process based on the values of the individuals and the team—the result was a 40% increase in performance. Recognition is different from feedback or rewards. Recognition is the emotional side of the workplace; it tends to be more public and intangible. When creating your rewards and recognition, don’t forget to keep each individual’s Personal Style in mind. One size does not fit all—some forms of public recognition may be inappropriate or uncomfortable for someone. Success in managing and leading others is a constant, organic process. 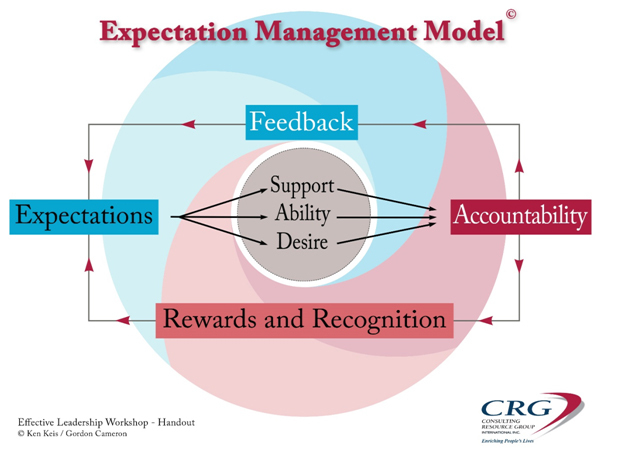 As you can see in the Expectation Management Model©, the arrows and flow are circular. That means it reflects a journey; we are never done adjusting, improving, and updating as we go. Don’t become stressed that something is not working. Simply use this powerful model to address the elements that need attention and move on, acknowledging that ongoing improvement and change is part of the process. Ken Keis, Ph.D., President of CRG, is a global expert on leadership, wellness, behavioral assessments, and life purpose. In 28 years, he has conducted over 3000 presentations and invested 10,000+ hours in consulting and coaching. Ken Keis is considered a foremost global authority on the way assessment strategies and processes increase and multiply your success rate. He co-created CRG’s proprietary development models and has written over 4 million words of content for 40 business training programs and 400+ articles. His latest book, The Quest For Purpose: A Self-Discovery Process To Find It And Live It!,is available at thequestforpurpose.ca.